Thousands of acres of BLM and forest service lands in Lake County are a mecca for you to explore with your best pal(s). The larger areas such as Boggs Mountain and Highland Springs Recreation Area, as well as a few County parks also allow dogs. However the County of Lake has a leash law, and it’s prudent anyway to keep your pets on leash for everyone’s safety: for you, your pet, other folks and their pets, as well as for wildlife. Remember to bring ample supplies of water for you and your pet especially when exploring the backcountry. And never leave your pooch in the car even on warm days – it’s dangerous and illegal. The Animal Control Website has valuable links and useful information for your pets. The map below gives some great locations on trails as well as lightly used rural back roads to walk your dog. Feel free to contact us to suggest other good areas to walk with your dog. Every year in the spring, the Friends of Boggs Mountain (FOBM) holds its “Dogs at Boggs” event, including an informative presentation by a special guest, followed by a walk on the trails and of course, lots of doggie treats! Contact FOBM for more information. In the fall, an event combining beer and hotdogs, almost literally, very hot, panting dogs, takes place at the Lakeport Oktoberfest, organized by the Lake County Chamber of Commerce. 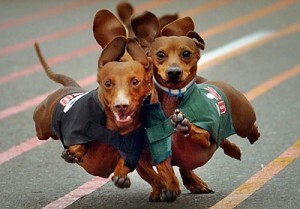 The “Dachsund Derby” – is a must-see, a hilarious activity for dog lovers and families. Contact the chamber to submit an application for your favorite “Dackel”.